As Trevor and I scroll through the messages on Teach Piano Today’s WunderKeys Facebook Group we can’t help but notice that teachers are quickly filling up their studio schedules with preschool students! This means that in the coming weeks you may be introducing little ones to the piano for the very first time. This is a milestone moment in a child’s life… a moment that could lead to a lifetime of music. It is a moment that needs to be special. In past posts, we have shared a number of first piano lesson memory makers and today we have one more that will thrill your youngest students. Our Preschool Piano Trading Cards will help you introduce the WunderKeys preschool characters, share a little bit of fun information about yourself, and learn some fun facts about your piano students. 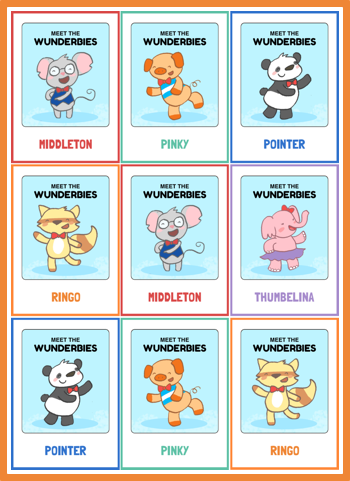 Click on the image below to download your copy of the Wunderbies Preschool Piano Trading Cards. Print them double-sided on card stock and give your new preschool piano student his or her very own set at the first lesson.